You would not want to come across a hungry coconut crab. It measures 3 feet wide, can lift up to 62 lbs and has a crushing force stronger than the bite force of all land animals save the alligator. 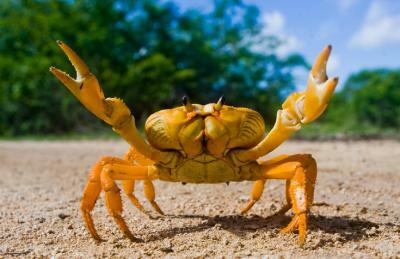 These crabs can climb trees, crack open coconuts and live on islands in the Pacific and Indian oceans. Although Airbnb has no claws and is not able to roam tropical white sand beaches, if it did, it would most likely be considered a coconut crab given the way it is crushing the sharing economy. While most community banks may not be huge players in the mortgage loan business, Airbnb may point to a murkier future in other loan sectors that go well beyond residential lending. Airbnb is a software platform that helps homeowners become temporary hotel hosts in locations all over the world, by renting their places for short terms. Interestingly, a recent study by Pennsylvania State University found 33% of Airbnb hosts in 12 major cities operate full-time rental businesses. Some even operate multiple units and rake in sizeable revenues. That said, most Airbnb hosts are still very small operators. Forbes notes 75% of the hosts earn less than $10,000 a year. However more aggressive types, particularly those with multiple properties, are running substantial businesses. In fact, about 75 people gross more than a $1mm per year each through Airbnb rentals in the US. We wonder which banks have loans on those properties and whether they know this is happening. When borrowers become hosts, the line between originating a generic home loan and something more akin to a business loan can become blurred. From a bank's perspective, borrowers that rent out their homes frequently mean those homes are now investment properties rather than primary residences. The sharing economy continues to explode and this is just one small area that has taken off. Bankers must be creative and stay on top of trends to protect themselves as opportunities are explored, and that can be difficult. After all, the rules are different; income streams are hard to assess and the amounts to be financed can be small. In this home-hosting area alone an online lending company called Playfully is in the space competing with banks. It makes loans to Airbnb hosts using future bookings as collateral. Then, when hosts get paid by Airbnb, Playfully automatically deducts money to pay back the loan. Its business plan is based on the fact that Airbnb hosts often lack the cash flow needed to pay for such basic things such as cleaning services and repairs. It also leverages this sharing economy phenomenon under the assumption that Airbnb can provide enough renters to hosts to make them good borrowers and pay off the loans. For community bankers that originate loans to the lodging industry now and again, you might find it interesting that Airbnb has a market value that exceeds Marriott, Starwood, Expedia or Wyndham for example. As Airbnb hosts find themselves searching for financing or refinancing, community bank lenders may or may not have interest. At a minimum though, monitoring what is happening here, keeping tabs on the impact to other lending activity and ensuring your teams bake all of this into the ability to repay for existing loans is important. Things continue to change, so bankers may soon find themselves reconsidering how to value loans, what inputs are critical, what sort of competitive analysis may need refinement and other factors. In the meantime, as you stroll the beaches this summer in some faraway places, be sure to watch where you walk to avoid the claws of the coconut crab. Yields dropped 4bp despite continued solid consumer confidence as economic data comes in weak. 1) Wells Fargo announced it would close 400 branches by the end of next year, in an effort to cut costs and address changes to customer behavior. Wells has about 8,600 locations, so this represents about 5% of the total. It expects to shift resources toward automated systems and online banking. 2) SunTrust said it would close 99 branches and open 8 for a net reduction of 91 by Q2 of this year. That is about a 7% decrease overall. House Speaker Ryan told congressional lawmakers that deregulation aimed at relieving the financial sector from undue regulations will be a top priority this year. Dodd Frank is expected to be in the crosshairs, as conversations swirl in DC about ways to modify or replace it. 1) First Guaranty Bank ($1.5B, LA) will acquire Synergy Bank, SSB ($154mm, TX) for about $21mm. JPMorgan said it will allow Intuit's personal finance applications to access the data of the Bank's customers after being authorized using application programming interfaces (APIs). Intuit owns Turbo Tax, QuickBooks and Mint and the change puts pressure on other banks to follow its lead or risk losing customers. President Trump signed an executive order designed to sharply reduce the number of federal regulations. The White House is seeking to boost economic growth by relieving the burden on businesses. Components of the order include requiring federal agencies to repeal 2 existing regulations for each new one they enact and restrict the ability of agencies to increase regulatory costs they impose on businesses from current levels.